Every Monday through Friday night for over 40 years, people in need have been coming to Bishop Sullivan Center’s community kitchen at 39th and Troost for a hot meal. The kitchen was small, its dining rooms were crowded. On average, about 250 meals were served each weeknight. That’s a lot of meals to serve in such a small area. Something needed to change. Over a year ago, Bishop Sullivan Center’s staff, board, and recipients of this hot meal reflected on how this service could be improved. Two goals surfaced. 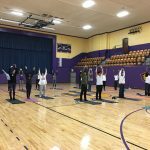 One: provide healthier meals, and two: make the dining environment more comfortable. The small kitchen only had enough room and the equipment to heat up donated leftovers; there was no way to prepare fresh meals. The dining room was so tight that, on a full night, it was like eating dinner in the middle seat of an airplane, elbow to elbow. The dining rooms are located in the back of what used to be a gymnasium and it looked like it. In a survey we conducted among those who come for the meal, we learned that many suffer from diabetes, hypertension, heart disease and obesity. To provide healthier meals would require a full-size, fully equipped kitchen with a chef. 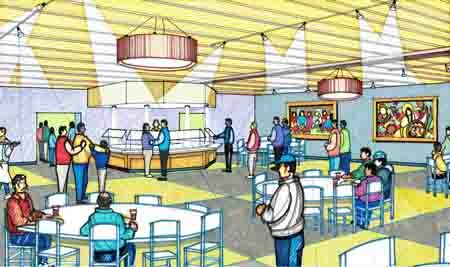 To accomplish our second goal, to literally give people more elbow room, would mean expanding the dining area. To reach those goals would require a total renovation of the space. 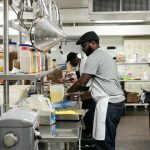 So, last August, we closed the community kitchen to begin this project. While closed, we continued to offer meals out of the basement of St. James Catholic Church just around the corner at 39th and Harrison. 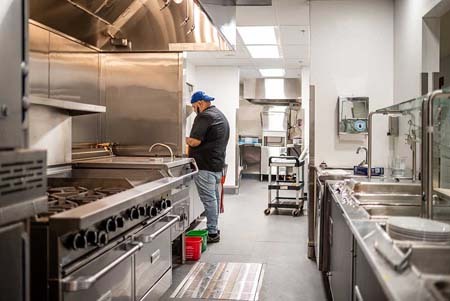 Now that the renovation is complete, we have a full-size commercial kitchen with the appropriate appliances to prepare fresh and healthy meals, complete with a salad bar. 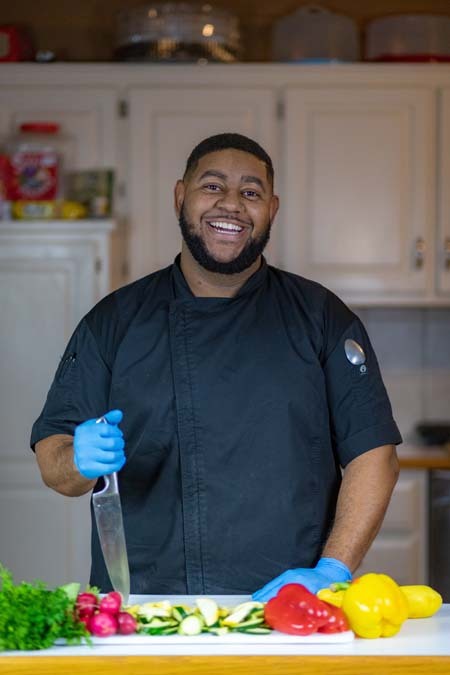 In the kitchen is our new chef, Dwight Tiller II, also known as “Chef D.” He recently was a line cook for the Kansas City Chiefs and has helped with his parents’ catering business for all of his life. His experiences prepared him well to put together hearty, nutritious meals, and he’s passionate about serving our community. Recently, a dinner guest sought him out to express gratitude for his dinner and shared how motivating this meal was for him. The new, expanded dining room looks like a restaurant, not the back of a gymnasium. 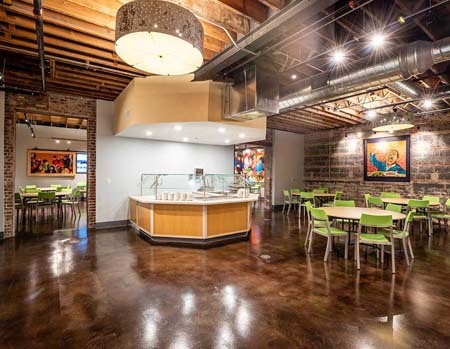 With original artwork and exposed brick walls, many volunteers have said it looks like a restaurant one would find in Westport or the Crossroads. 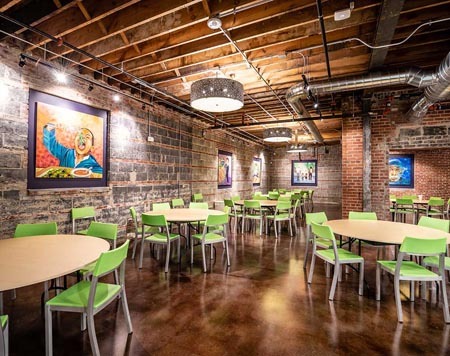 In this new community space, we invite people of all economic backgrounds to join us for dinner, served Monday-Friday, 4:30-6 p.m. at 3936 Troost Ave. For those who are able, they are welcome to make a donation to help cover the cost of the meal. 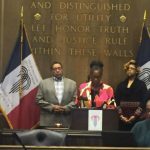 Troost has historically been an economic and racial dividing line in Kansas City. By inviting all people to come and dine here regardless of income or zip code, we hope to take a small step in making Troost a unifying line, rather than a dividing line. Hence, we call the new eating space One City Café. Together, we can unify our city, one meal at a time. How can I get a print copy of this article so I may share it with others ? I’m so sorry we don’t have “easy” button for this option! It’s best to share the link, but if you truly need to print, I’d suggest checking the printing settings to ensure that you don’t print the pages with the needless footer and side navigation information.